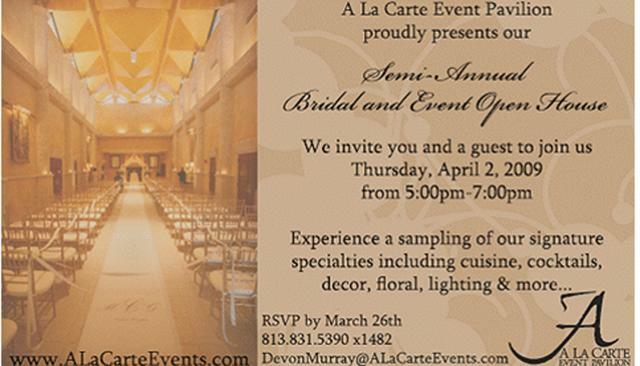 Good thing our friends over at A La Carte Pavillion don&apos;t share my views on love and happiness, otherwise they wouldn&apos;t be able to bring you great events like the Semi Annual Bridal and Event Open House. For those of you that had already booked your event at the Pavilion or are considering our venue for an upcoming party, this is your chance to preview their signature specialties! Be inspired as they unveil samplings of gourmet cuisine, cocktails, innovative decor and other event essentials. You and a guest are invited to join us on Thursday, April 2, 2009 from 5pm-7pm for our Semi-Annual Bridal and Event Open House. Our destination is not only great for Conventions in Tampa Bay and Tampa Florida attractions! Wedding planners and brides have great weather as well as unique venues and staff at places like A La Carte to help them plan their events. If you are interested in attending, please contact DevonMurray@ALaCarteEvents.com or call 813-831-5390 x1482. Reservations are required before March 26th.